In its simplest form the water containing hardness salts passes through a column of small plastic beads called resin. Immediately the hardness salts attach to the resin and soft salts pass into the water. There will come a point when the softener cannot remove any more hardness, at this time the resin will need to be cleaned or “regenerated”. This is achieved by the bed of resin being isolated from service and a concentrated salt solution passed through the resin. The salt solution displaces the hardness and reconditions the resin. All of the salt is then fully rinsed out of the resin by fresh water after which the resin is able to go back into service and remove more hardness. Resin life is usually around 20 years but its life can be shortened dramatically with the high levels of chlorine and or iron occasionally found in the water. Why are there different types of softener? All water softeners use resin to remove hardness and use salt to clean the resin when it gets full. But there are many different types of resin and as with most things in life the better and more expensive the resin the more efficient it is in removing hardness, resilient to attack from chemicals and longer its life expectancy is. Electrically operated machines use an electronic controlled valve head driven by an electronic motor to operate the regeneration (cleaning process). Within this category there are two different methods used to initiate the cleaning process; the cheapest uses a simple time clock where the user selects a set time for the regeneration to occur. 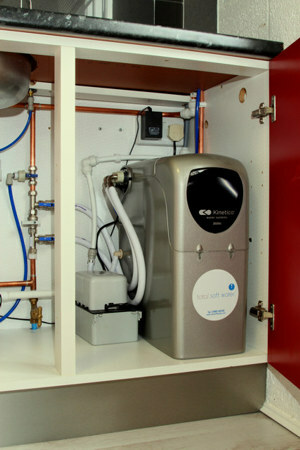 The other type (metered) measures the water consumed and then starts the regeneration cycle once a predetermined volume of water has been softened. Clearly the meter type is more efficient as it only starts a regeneration when necessary, if you have people stay with you or you go away on holiday the softener will automatically reconfigure its cleaning (more frequent for visitors and not at all when you are away and no water is being treated). The cheaper time clock however will carry on cleaning at preset times which could result in not enough water being softened when visitors stay over or salt being wasted by regenerating unnecessarily when the house is empty and water is not being used. Consumers often find it difficult to determine when to set the regeneration time. Non electric machines have advantages over electric machines in that there are no timers to set and, of course, within the humid and salty environment of a water softener, where electricity and water do not make good companions, non electric valves will arguably be more reliable too. All non electric machines measure the water volume used and start their regeneration once a preset volume of softened water has been produced. An added advantage of non electric machines is that nearly all of them have been specifically designed to use Kinetico Block salt or Harveys Block salt. Up until recently all non electric machines used two resin columns however a few single column non electric machines have recently entered the budget end of the market. Unfortunately these single tank machines will always pass hard water to service when they enter their cleaning cycle if there is water demand. The usual non electric machines utilise a combination of two resin tanks. The original non electric machine, and again, arguably the best, is manufactured by Kinetico with many thousands sold in the UK over the last 40 years. Their softeners use 2 x 100% duty resin columns with one in service and one on standby with automatic change over thereby always ensuring a constant supply of softened water whatever the demand. The other type is manufactured by Harveys Softeners. This machine uses both resin columns together in parallel. After a preset volume of treated softened water has been produced, one column comes out of service for regeneration whilst the other takes on the full service duty. When finished the freshly regenerated tank takes over the service duty and the other column regenerates, afterwhich it comes back into service after cleaning and shares the service duty. Harveys softeners call this Duplex Parallel operation. Their Softener is often supplied under separate brand names such as Megatwin, Twintec, MiniMax, Crown and Harveys HV3. We hope that this review is helpful. Total Soft Water can supply any machine although we prefer to only supply machines and equipment that has proven itself to be reliable and trustworthy.